The Kim Mun Lanten people plant their cotton in the forests and alongside their rice paddies. Our week-long visit in summer, unfortunately, did not coincide with the harvest and ginning season (December and January), but cotton spinning and textile dyeing and weaving are year-round activities in some local villages, and we were eager to explore what we could of the local textile traditions. 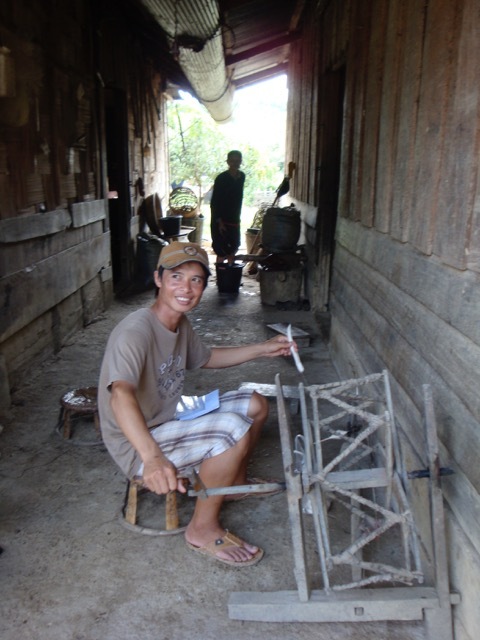 After all, seeking out people making traditional, village-use items nearly always leads to an adventure. 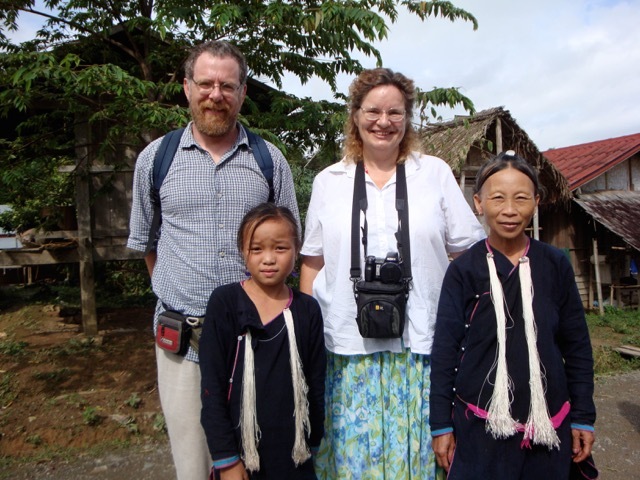 Josh and Maren pose with a Lanten mother and daughter a NW Laos. The day after our Akha spinning lesson, Tui guided us to a village of the Kim Mun Lanten ethnic group, a people renowned for their cotton spinning and weaving. 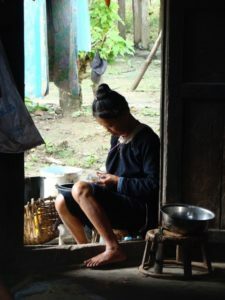 The locals of the village were very surprised to see Western visitors, and perhaps thirty or forty women and children crowded closely (the men were working in the rice fields). It took a few minutes to get used to the closeness of the people and the seeming infringement on what we feel is our “personal space.” However, the shared smiles and nods and Tui’s cheerful demeanor and explanation quickly melted any awkwardness. The women of the Lanten village wore loose-fitting handspun cotton tunics that wrapped and tied across the chest and loose-legged knee-length pants, all dyed to a rich, deep blue with locally harvested indigo. The outfits were modest and, from a distance, unadorned. Upon closer inspection, however, each jacket had a thin strip of color at the collar, cuff, or edging. From a frog closure on her neck, each adult woman wore white or pink streamers of silk (or acrylic), which they constantly threw over their shoulders when doing handwork, and a shorter tassel of silk on each end of a thin woven-cotton waist-belt. Several wore handmade earrings and hair clips of silver or “white bronze,” an inexpensive alloy made of copper, tin and zinc. 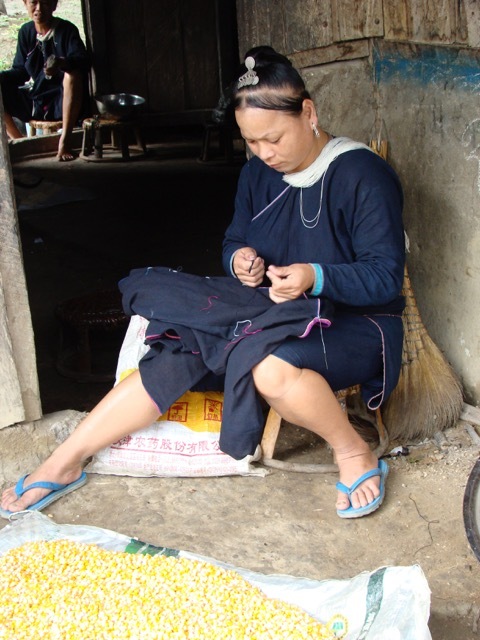 A Lanten woman sews the edging onto her indigo-dyed handspun cotton outfit. When Tui explained that we were searching for local textile traditions, one forward woman grabbed Maren tightly around her arm and marched the whole parade of us through the village to her home. She opened up a fast conversation with Maren as if Maren could understand every word. Tui gave up trying to interrupt with a translation. However, Maren, undaunted, smiled and eventually responded with equal enthusiasm, albeit in English, about our desire to see their art. Neither understood the other’s vocabulary, but they shared a sense of curiosity and opportunity. They both laughed and leaned on each other as they walked up the dirt slope. Her village-built spinning wheel was in the breezeway of her modest wood home. Maren gestured for the woman to sit on the low stool and demonstrate her technique. The woman sat down and picked out a 6-inch (15 cm) tube of clean unspun cotton. In a previous process, Tui translated, the ginned, fluffed cotton had been gently rolled onto bamboo sticks, and then the smooth stick had been extracted to leave these snakelike cocoons tubes of cotton. A Lanten woman spins cotton. Holding the soft cotton in her left hand, the woman cranked the wooden spinning wheel deftly with her right. The cotton fiber was hooked onto the end of a horizontal spindle, and as the bobbin spun, she smoothly pulled back her left hand, letting the spindle efficiently twist the fiber. When the twisting yarn reached an arm’s length, she leaned forward and the fiber dropped from the hook; the spindle then hungrily zipped up the length of yarn onto the shaft. The smooth-motioned dance of creating a fine yarn was repeated, repeated, and repeated again, her bobbin growing with a small pulse following each inward reach. Maren smiled and nodded emphatically as the woman demonstrated her efficient motions with the handbuilt device (which could also function as a skein winder, hence the wide Ferris wheel shape). The spinner looked at Maren and then pointed to a plastic bag full of cotton rolls. Maren laughed and stretched out her arms to indicate the amount of cotton and length of time the present project would require. The woman smiled broadly, then squared her shoulders and turned back to again demonstrate the process. Soon, Maren took a turn with the spinning, and then Tui wanted to try—Hah! A man spinning cotton! Tui posed as a pompous spinner and flippantly spun the wheel. The women, the kids, and Maren and I laughed so hard we nearly fell over. Five minutes later we were at a neighbor’s home, around in the back under a tin roof. Here sat a full floor loom, complete with a handmade bamboo comb in a teak frame, a substantial timeworn shuttle, and what seemed like an acre of half-meter-wide handspun cotton cloth rolled onto the loom’s front bar. A woman sat at the loom and worked the two wooden treadles. Tui translated her explanation of the Lanten weaving technique. She then allowed us to photograph the loom; she herself, like many others, asked not to be photographed. Two plastic pitchers of water appeared. A nine- or ten-year-old girl, presumably a daughter or niece, filled the single glass and offered it first to Maren, who thanked her and then raised the glass to the surrounding community. “Kop chai lai lai,” Maren said in Lao. “Thank you very much.” She finished the glass quickly and passed it back, and then we each in turn had a moment with the glass and a chance to share a word or nod. Hand-spun cotton being handwoven. Look at the patina on that huge shuttle! Before we left, several women brought to us cotton yardage they wished to sell, some plain white and some deeply dyed in their traditional indigo. 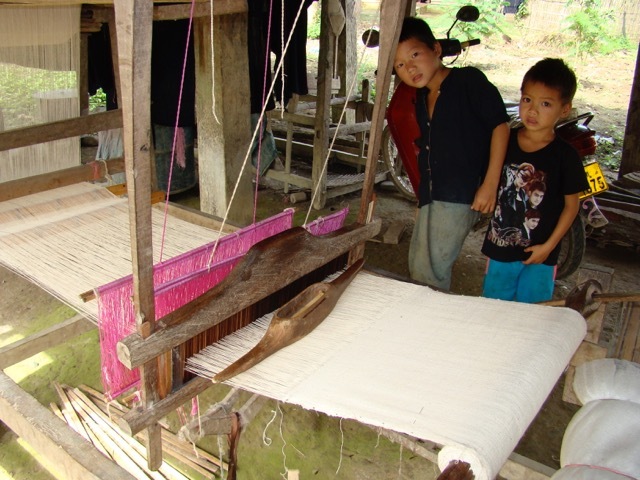 As in most of rural Laos, prices were set; these savvy spinners and dyers were not in the least naïve about the quality or value of their time, effort, and product. As for us—we could not have had a richer day.